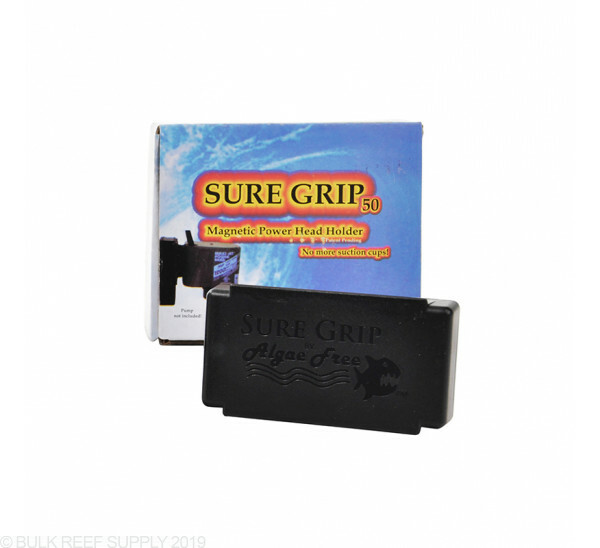 Algae Free Sure Grip Magnetic Powerhead Holders allow powerheads to be attached anywhere on aquarium walls. Traditional suction cups will fail from time to time, allowing your powerhead to flow around anywhere in the tank. By changing out the suction cups for reliable magnets, your powerhead will never move unless you want it to. 1-3/4" x 3-1/8" x 3/4"
These are the best! Your power heads stay where you put them! Love them! No more worrying your power head will fall. The sure grip magnetic power head holder is great! I had stopped using my SEIO Super Flow M820 because failing suction cups kept creating crazy sand storms. However, with the sure grip, my M820 is useful again, and my tank has appreciated the increased flow. Don't let suction cups ruin your tank. It was good to get rid of the suction cup mount on my maxi-jet pump. Much more secure way to mount a powerhead. My only negative is that the adapter fits a little loose where it attaches to the powerhead. I was not sure that this was going to work...that is I was worried about potential noise transferred to the glass from the 1200 Maxi jet pump. I have been very happy with the strength of the magnet it keeps the pump exactly where I want it and it actually helped reduce the overall amount of noise from the pump. I can say this is way better than the cups that I have used for years. This sure grip however does not come with brackets to mount tunze stream pumps. You have to have two of the factory brackets that came with the tunze pump to mount it to the magnet. Please keep this in mind before buying as I was told differently before I bought one. Hated the suction cup that came with the maxijet 1200. Love the Sure Grip! The Sure Grip 50 magnetic attachment system is a wonderful addition to the maxijet 1200 pump. The old suction cup method works for about 6 months and then falls off where the Sure Grip 50 holds secure indefinately. All I can say is AWESOME. The magnets on this thing are strong - well worth the price. You can use it for more than just pumps - makes it easy to mount things inside a sump without making more holes. Of course, it also makes moving powerheads around a breeze - very highly recommended! Suction cups are an accident waiting to happen. Don't risk not using a Sure Grip.